Hook/Eye amd Eye/Eye Galvanised Steel Straining Screw / Turnbuckle. Used to tension wires and ropes. 5mm Straining Screw - Hook/Eye. Size 5mm, Body Length 74mm, Eye ø 8mm, Hook ø 6mm. Galvanised forged steel. Straining screws are also known as Turnbuckles. 6mm Straining Screw - Hook/Eye Size 6mm, Body Length 89mm, Eye ø 10mm, Hook ø 9mm Galvanised forged steel Straining screws are also known as Turnbuckles. 8mm Straining Screw - Hook/Eye Size 8mm, Body Length 104mm, Eye ø 11mm, Hook ø 10mm Galvanised forged steel Straining screws are also known as Turnbuckles. 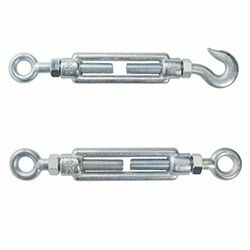 10mm Straining Screw - Hook/Eye Size 10mm, Body Length 133mm, Hook ø 14mm, Eye ø 12mm Galvanised forged steel Straining screws are also known as Turnbuckles. 10mm Straining Screw - Eye/Eye Size 10mm, Body Length 133mm, Eye ø 12mm Galvanised forged steel Straining screws are also known as Turnbuckles. 12mm Straining Screw - Hook/Eye Size 12mm, Body Length 140mm, Eye ø 18mm, Hook ø 13mm Galvanised forged steel Straining screws are also known as Turnbuckles. 12mm Straining Screw - Eye/Eye Size 12mm, Body Length 140mm, Eye ø 18mm Galvanised forged steel Straining screws are also known as Turnbuckles.